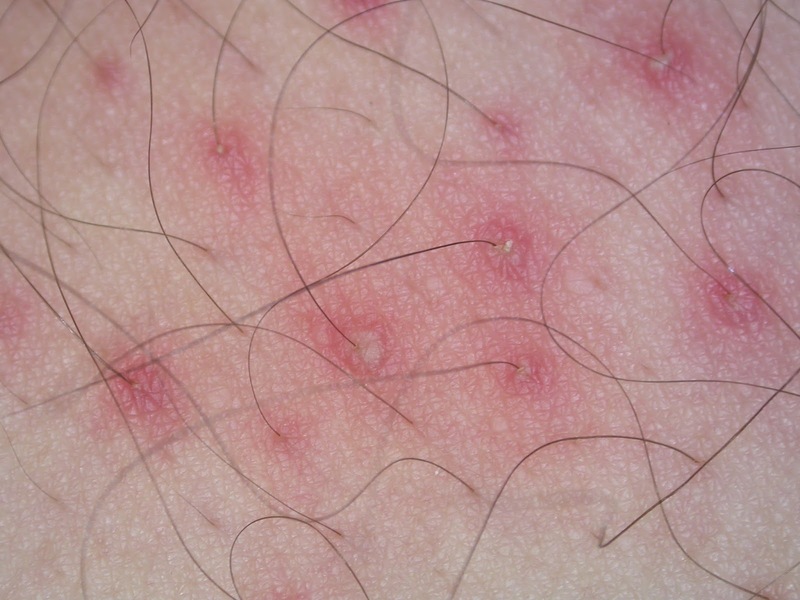 Folliculitis is a typical skin condition in which hair follicles get to be . It's generally brought about by a bacterial or contagious disease. At first it might look like little red knocks or white-headed pimples around hair follicles the minor pockets from which every hair develops. The disease can spread and transform into non-healing, irritating wounds. The condition isn't life-undermining, yet it can be irritated, sore and bothersome. Extreme kind of infections can bring about perpetual male pattern baldness and scarring. When deep-seated and chronic, it is called sycosis; and the skin around the pustules becomes reddened and crusted. In most cases of sycosis, several to many follicles are involved. Symptoms are not usually acute, being limited to mild burning and itching, with pain only when an involved hair is pulled. Contamination of other skin areas by pus from a pustule is likely to lead to infection of other follicles. If not properly treated, folliculitis may become chronic and persist for months or even years. It is sometimes confused with barber's itch, which it resembles to some extent. Pityrosporum folliculitis is a condition where the yeast, pityrosporum, gets down into the hair follicles and increases, setting up a bothersome, irritating pustules or blisters like mass. sometimes, pityrosporum folliculitis may be the reason of acne that is not improving even after use of antibiotics. It is particularly regular in the cape pattern (upper back and chest area) and the pimples are pin shaped. Pityrosporum folliculitis is not a disease accordingly; it is an abundance of mass developed by skin complexion process. The yeast abundance might be enhanced by number of factors. The reason why a specific patient gets pityrosporum folliculitis is not completely understood. 1. Apply 2 % - 5 % ammoniated mercury ointment several times a day, spreading the remedy onto the surrounding skin to help protect it from pus contamination. 3. If a pustule is on the upper lip, the nose, the eyelids, or the face on either side of the nose, or if it does not clear up within one week.